This is a great team building activity which will encourage the young people to work together to complete the challenge. Unless you are going to an activity centre which has a pre-setup spiders web you will need to create your own. The easiest way to do this is to set up the spider’s web between two trees, all you need is some rope and some imagination to get you going. Make the holes different sizes, with one or two larger and one or two much smaller, but you should ensure that it is possible to get someone through each of the holes. Ideally you are looking for a team to be between 5-8 young people. 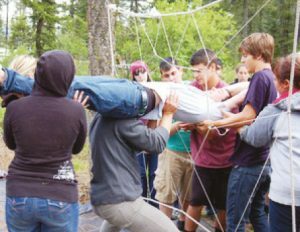 The challenge ahead is that each young person needs to make their way through the spider’s web, but once a hole is used it is then closed and cannot be used again. The team will need to think about the order in which they attempt this challenge, and how they are going to go about assisting team members to get through available holes on both sides of the web. The challenge could be based on teams competing against the clock or if you have only one team then they could have several attempts to see how quickly they can complete it after a practice. You could introduce penalty points if there is contact the web (rope).